Antigua Represented at the 11th Commonwealth Youth Forum in London. Photo caption: Far left, President of the National Youth Council Ms. Russhell Ellis, and member Mr. Vere Aaron, along with Commonwealth Youth Representatives in London. The recently-held Commonwealth Heads of Government Meeting in London was not only inundated with high level meetings and bilateral meetings, but also saw proactive and engaging Youth-Focused meetings and concrete action plans. 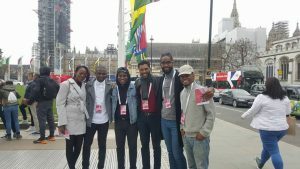 Antigua’s Youth presence was felt during the Commonwealth HOG when President of the National Youth Council of Antigua and Barbuda, Ms. Russhell Ellis, and member of the National Youth Council, Mr. Vere Aaron, travelled to London from 15th – 18th April, 2018, to attend the prestigious 11th Commonwealth Youth Forum. 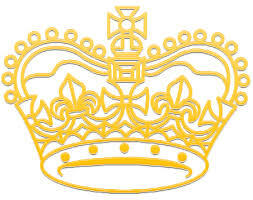 They went with the aim of ensuring that the concerns of the nation’s youth were represented through youth-led initiatives, endorsed by the 1.2 billion young people of the Commonwealth, and proposals implemented by governments of Commonwealth Member States. Attended by over 400 young people, representing more than 50 countries, the forum provides an opportunity for the youth of the Commonwealth to build cross-cultural connections and networks, debate the challenges facing their young people, and influence decision-makers. During the visit by Ms. Ellis and Mr. Aaron, both delegates engaged in plenary discussions and action-planning breakout-sessions, focused around the Commonwealth Heads of Government (CHOGM) four themes: Prosperity, Security, Sustainability and Fairness. 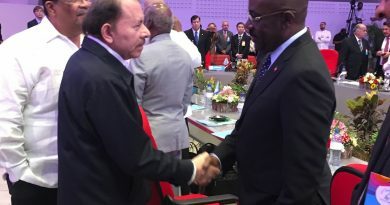 Additionally, as part of their group activity for the fairness breakout session, the delegation’s proposed project was adopted by the General Assembly and became part of the final action plan in support of promoting a fairer future as outlined in the declaration issued at the end of the forum. The declaration also features policy proposals that can be adopted by the Commonwealth Youth Council and youth-led networks, National Youth Councils, Commonwealth countries themselves, and or by the Commonwealth Secretariat. The 2018 Youth Forum was held under the theme “Powering our Common Future,” a reflection of the Commonwealth Heads of Government theme “Towards a Common Future.” The theme illustrates the powerful potential of young people across the Commonwealth in devising solutions to complex global challenges, as well as their ability to bring forward meaningful recommendations to the Heads of Government Meeting.